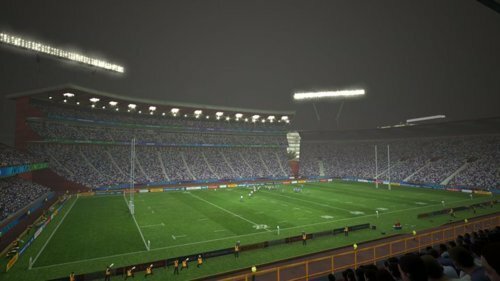 The newest version of the not-so know rugby games, RWC2011 brings it hard, cold, and straight for your face. You'll be bruised, crushed, scrummed, and punted all up an down that field, with little to no extra knowledge of what the hell just happened. 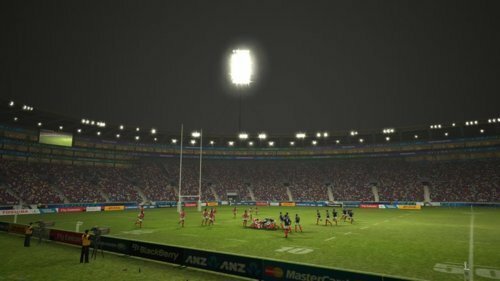 As a sport game, Rugby 2011 does it's best to streamline the process of playing games, but if you know nothing of the sport or how to play the game, it doesn't help you in the slightest. From full tournaments to warm up tours, you pick the teams you want in each session to play against and win with the highest point value possible. I had no idea how to go about playing this game, and luckily, the game did the review for me; it didn't teach me one bit on how to play this game. I found myself hitting the face buttons randomly to try and progress the game in which I only played for three plus minutes. Pick scrum, punt, or move were the main actions you could to do attempt to score, but not knowing anything but how to move, it really didn't matter. 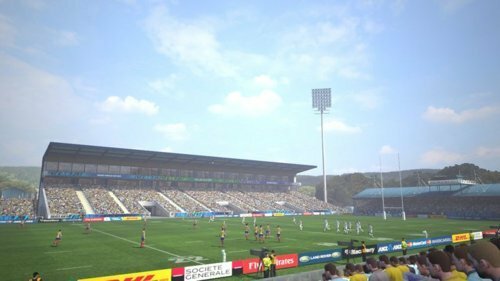 The full tournament lets you plot out in the real season of rugby or a randomized pool, so if you're into that thing, there's that. The online is non-existent, and the practice/warm-up tour helps nothing, so leaving the extra special shoot out, didn't give any exciting feelings my way whatsoever. It's like this game didn't want more of a fan base, much like the sport itself, here in the States, but if it weren't so clunky in it's toolset, things would have been somewhat enjoyable. I'm saddened that it didn't try harder. Did you see the big sport games' promos when the current gen consoles were being released/announced, and they all had that amazing sweaty look to the players that were in the action? Looking back at those now, compared to the better versions of today, Rugby looks like the launch sport games. Very little to no audience animation, the players on field look like old-school Atari Soccer sprites just with a blue triangle above one of them for your player, blocky close-ups of real life players, and horrible refresh rates for the actual animations themselves. The whole stadiums in the game are over saturated so get ready for a lot of blown out colors and way too bright grass. It's not a good looking game and that's at face value. I'm sure that it's predecessors looked even worse, but I wouldn't know about them and I definitely don't want to find out if they update/fix them in versions to come. Um...awkward. Going into this blind, I wasn't setting anything up to go good or bad, I just played(read tried to play) a game. I can honestly tell you that I had no fun at all playing this game. It was confusing, overwhelming, and down right frustrating trying to wrap my brain around it. If you are a fan of this game, then I bet that this installment is the best one you'll find for a long time to come, but if you aren't a fan, I suggest you stay away from it, lest you like hurting your brain. Rugby Would Cup 2011 is a poor game. Poorly made, poorly executed, and lackluster title, that causes an insatiable need to cleanse oneself after being played. It's not a top tier game, and shouldn't be regarded as one, so just leave it be and no one will get hurt. Although I cannot say that Sports Champions is a perfect game, it is a great first step into the Playstation Move and motion gaming. Sure I would not have chosen the same sports as what Sony put on the disc, but even with what is offered Sports Champions proves to be a great experience. The game nailed the atmosphere and the intensity of the World Cup in a way that sports games have tried but never succeeded in doing. And for that I would say if your counting down the days until the World Cup to start like I am this is a great way to help ease the wait. There is no doubt about it; Dead Space 2 is one of the most intense video games ever created and one that should not be missed. Whether you played the original or not, this is the first game of 2011 that I would say is a “must own”. I was surprised to find that 2K Sports actually seemed to have more success this year with their freshman arcade baseball series, which actually comes out as a big success. If you enjoy the occasional arcade sports game, then checking out The Bigs for the PS3 would be a great idea. Although I don’t know how many pure Rugby fanatics there are out there, I do know that many of you should give this game a shot. If not just to learn about the sport, then to just enjoy the great mechanics that the game sets before you. If you have ever been interested in Rugby, this is the game to check out for you.